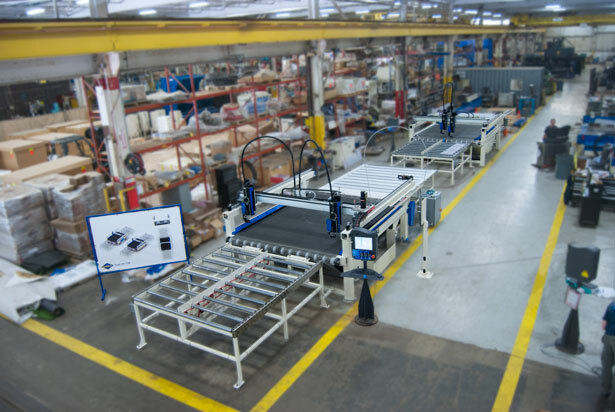 WARDJet has designed and built a unique system of two J-Series water-only waterjets. These two J-Series pure water cutting systems will work side by side running a similar program. It was imperative to the customer that these waterjets cut at a high speed and that the material stay dry. The WARDJet J-Series waterjet is a great option for customers with both of these requirements. WARDJet is excited to witness the improved production our customer will experience with two of the high quality waterjets running at once! 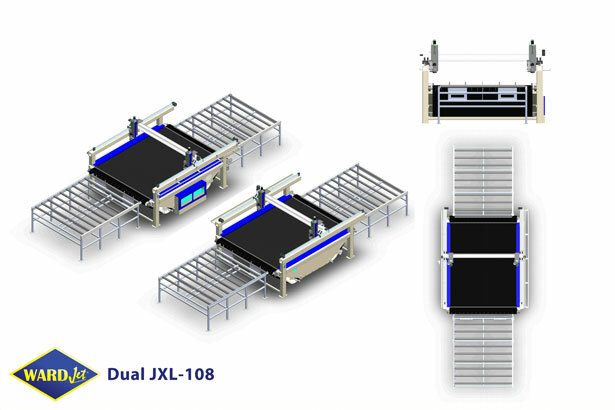 Featuring mechanized loading and off-loading tables for large sheets of material, these two J-Series will greatly improve production for our customer. Optical eyes detect when the material has reached a predetermined spot on the table. Once the material is in position, motion is stopped so that the waterjet can begin the cutting program. After the program is finished running, table motion resumes and the cut material is moved to the off-loading table. Both J-Series waterjets feature a custom stainless steel cutting table which is designed to eliminate the need for water bricks. As a result, the consumable cost of replacing water bricks that most pure water waterjet owners have is eliminated. Also, the stainless steel cutting table utilizes a unique baffle design to transform the highly pressured water stream into steam by the time it reaches the bottom of the tank. This baffling protects the bottom of the tank from the damaging effects of high pressure water. These dual water only waterjets are a perfect example of how WARDJet is able to adapt a standard design to precisely fit a customer's application. Instead of having a system built from the ground up, why not contact WARDJet to see if our systems are right for your needs? To read more information about the J-Series pure water waterjets, visit our J-Series web page.